What Does Electronegativity Have to Do With Oxidation Numbers? What Are Bromine Oxidation Numbers? Bromine is element number 35 on the periodic table, meaning its nucleus contains 35 protons. Its chemical symbol is Br. It is in the halogen group, along with fluorine, chlorine and iodine. 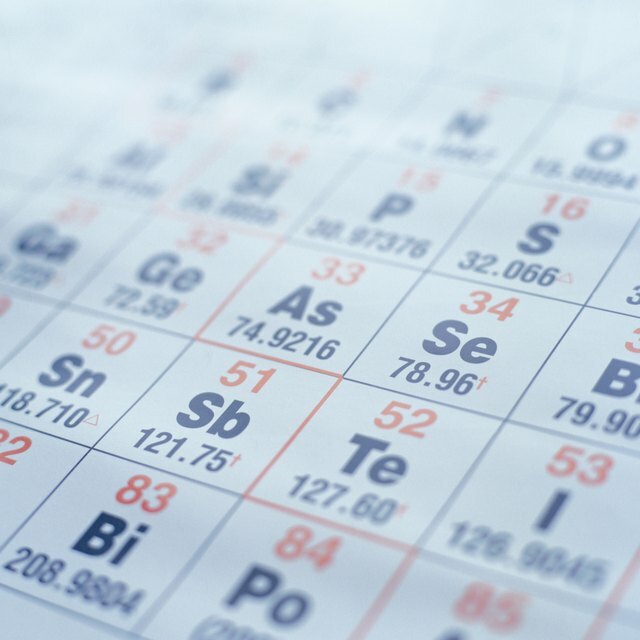 It is the only non-metallic element that is liquid at room temperature. It is reddish-brown and foul smelling. In fact, the name "bromine" comes from the Greek work "bromos," which means "stench." Bromine vapors irritate the eyes and the throat, and it can cause painful sores if it contacts bare skin. Oxidation numbers refer to the ways in which an element shares electrons while part of a compound. Positive oxidation numbers indicate that the element gives up electrons and acquires a local positive charge. Negative oxidation numbers indicate that an element takes extra electrons and acquires a local negative charge. Keep in mind that these numbers are useful for keeping track of electrons in chemical reactions, but they don't represent reality perfectly. Oxidation numbers assume that all bonds are 100 percent ionic, meaning that electrons are given or taken but never shared. This is rarely the case in actual compounds. The most common oxidation numbers of bromine are 5, 4, 3, 1 and -1. Within any given compound, bromine only has one of these oxidation states; the different numbers represent how bromine behaves in different compounds. When determining the oxidation number of an element in a compound, it helps to use elements such as oxygen or fluorine, which almost always have the same oxidation number, as a guide. The sum of all the oxidation numbers in any non-charged compound is always zero. The bromine atom in bromine fluoride, or BrF, has an oxidation number of +1. In bromine dioxide, or BrO2, it has an oxidation number of +4. This is because fluorine usually has an oxidation number of -1, and oxygen usually has an oxidation number of -2. Moll, Eric. "What Are Bromine Oxidation Numbers?" Sciencing, https://sciencing.com/bromine-oxidation-numbers-8509657.html. 24 April 2017.